I didn’t have high expectations for Despicable Me. Despite the growing number of excellent animated films coming from studios other than Disney and Pixar, I’m always skeptical of feature films not coming from the big two. There are a lot of kid’s movies still being made on the premise that children will watch anything so long as it’s animated, and their parents will buy tickets because there’s usually only one family friendly movie in theaters at a time and they have no choice. So it’s encouraging to find something like this that puts a lot of thought and care into everything. Despicable Me is a movie that sounds strange and silly, but for some reason just works. Gru (Steve Carrell), a super villain who has his ego crushed when an up-and-coming villain pulls off a world class heist (stealing the Great Pyramid at Giza), sets out to one up this upstart baddie. He soon adopts three orphan girls to help with his evil plan, and winds up becoming an excellent father. The story is sweet, but not overly saccharine. It relies more on laughs than pulling the emotional heartstrings, which helps set it apart from its Disney and Pixar counterparts. Despicable Me also casts an unattractive guy with a funny accent as its unlikely hero. Again, not a typical move, but one that somehow works. The final odd-but-brilliant choice is the Pharrell Williams soundtrack. This isn’t Elton John writing music for The Lion King, or even Shrek featuring Smash Mouth’s “All Star” in its opening sequence. It’s something cooler and quirkier. Despicable Me is a bit of a wacky send up to the animated features from the more established studios. It borrows all the right elements and successfully pushes a few boundaries. With all of the press that Disney and Pixar get, it is often hard to remember that other studios can make really good animated films. Despicable Me is a great example of this. It has no connection to Disney or Pixar, yet is still a very charming story with a good message for children and humour for the whole family littered throughout. Gru (Steve Carell) is an evil villain, disappointed that rival villain, Vector (Jason Segel), has stolen one of the pyramids in Egypt. To show he is still the number one evil genius on the block, Gru decides to plan the greatest heist ever and steal the moon. He plans to use three orphans (Miranda Cosgrove, Dana Gaier and Elsie Kate Fischer) to help enact his plan. Along the way, Gru begins to care for the three girls and realises the life of an evil villain may not be all it’s cracked up to be. As I said, this is a very charming film, on par with anything Disney have done in recent years. I won’t say it is up there with Pixar, because I don’t think anybody is on their level. Of course the real stars of the show are Gru’s minions. These little yellow lemmings were the breakout stars of this film. Their limited speech and sight gags make up most of the film’s laughs. The minions play a much larger role in the sequel because of their popularity and also have their own feature film coming out in 2015. It remains to be seen if these little guys are as appealing in large doses, but in Despicable Me the mix is perfect. The minions are by far the best part of this film, along with Russell Brand as Gru’s scientist helper. The film is not all about the minions though. I really liked this story of a super villain turned good. It is a really original story. No movie has had a villain be the hero of a movie, let alone one aimed at kids. 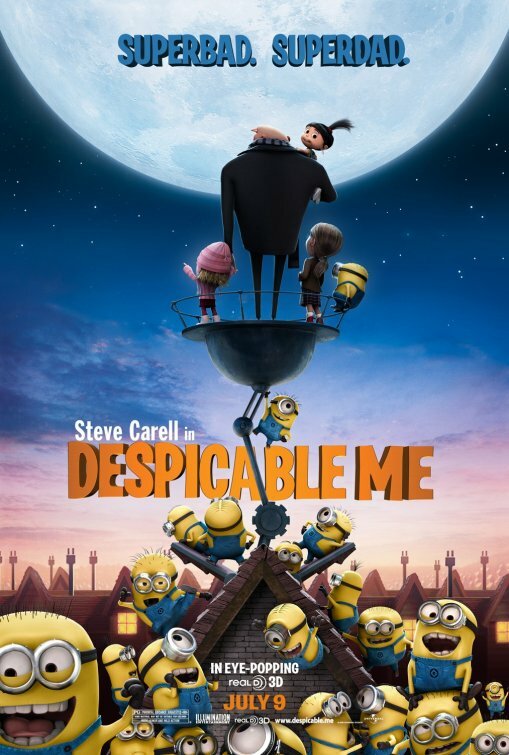 It was quite a risk to have the main character of an animated film be a villain, although Steve Carell’s Gru is not evil enough to scare a younger audience. He comes across as more of a bumbling sidekick than an evil genius, which actually ends up working for the film. Despicable Me is a really nice reminder that Pixar does not have a monopoly on animated films with heart. There is plenty here and enough laughs to keep the whole family entertained.